On Presidents’ Day, when most of Alabama’s high school students were home taking a well-deserved break from studies and classes, a group of thirty-one highly dedicated students traveled from all over the state with their teachers and supportive family members to the Alabama Shakespeare Festival in Montgomery to participate in the state finals of Poetry Out Loud (POL). In 2011 Alabama’s champion, Youssef Biaz, went to Washington, D.C. to become the National Poetry Out Loud Champion. This year, Alabama’s new State Champion, Khadijah Thompson, a student of Sheila Hadden at Bob Jones High School in Madison County, will be vying for that same spot, competing with forty-nine other state champions, a champion from Washington D.C., and one each from Puerto Rico and the Virgin Islands. She and a chaperone will travel all expenses paid to the national event. Alabama has added its own unique element to the program, providing an opportunity for students to recite their original poetry. This year, Mary C. Butgereit, also a student of Hadden, took first place in the State Original Poetry Recitation contest. The Alabama Writers’ Forum provides cash prizes for the top two scoring students in the Original Poetry Competition. All the students who become school winners are invited to a Finding Your Voice workshop, where they are coached in the interpretation of classic poetry, poetry recitation techniques, and the writing of poetry. Poetry Out Loud was piloted ten years ago when National Endowment for the Arts chairman, Dana Gioia, partnered with the Poetry Foundation to design a program that would bring the love of poetry as it was meant to be, an oral art form, back into the lives and curriculum of high school students across the nation. After a very successful year of implementation in Washington, D.C., the program went “viral,” with each state arts agency agreeing to host its own state competition and to send a state champion to the national finals. 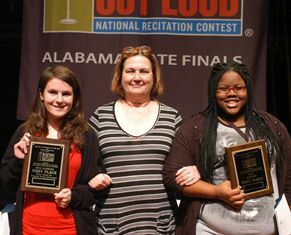 Alabama’s Poetry Out Loud program is administered by the Alabama State Council on the Arts in partnership with the Alabama Alliance for Arts Education. Another fairly new partner to the program is the Alabama Shakespeare Festival, which provides the venue and professional production crew to enhance the state finals. Artistic Director Geoffrey Sherman believes in encouraging young people in the art of performance. “This is just the sort of event we should have in our theatre,” he said. Additional partners that have held regional competitions for Alabama are the Mobile Arts Council, Auburn University, The Arts & Humanities Council of Tuscaloosa, and The University of Alabama in Huntsville. For more information, contact Diana F. Green, Arts in Education Program Manager at the Alabama State Council on the Arts, at 334-242-4076 Ext. 241 or diana.green@arts.alabama.gov.